We all know that mobile apps are one of the fastest growing trends in mobility these days. With their ability to keep you informed, staying simplified, and being cost effective, mobile apps are on the up and up. Just one look at your respective mobile app store and you'll see just how big the market is becoming. Keeping track of the ones worth noting can be rough, so I figured I would share three of them I have been using that are absolutely worth checking out. If you haven't discovered Feedly's mobile app, you are truly missing out! It's well organized, fairly straight forward to add and remove content, and it's presentation is top of the line. At first use, back when Google Reader (R.I.P) was still around, I was used to scrolling through the headlines of all my favorite blogs. It wasn't long before I realized just how beautifully Feedly organizes your feeds with picturesque themes. It also keeps track of some of the most recent blogs for when you have categories that build up to 300+ blogs a day. The app will show you some of the more recent entries and move on to the next category to keeps things interesting. The app also provides an easy way to share directly to Twitter or Facebook, which is really nothing new, but it does shorten the links of shared blogs to a 'feedly.com' address. With Feedly finally going cloud based, now you can easily follow feeds on your desktop, but the mobile app is definitely worth it when you are on the go. 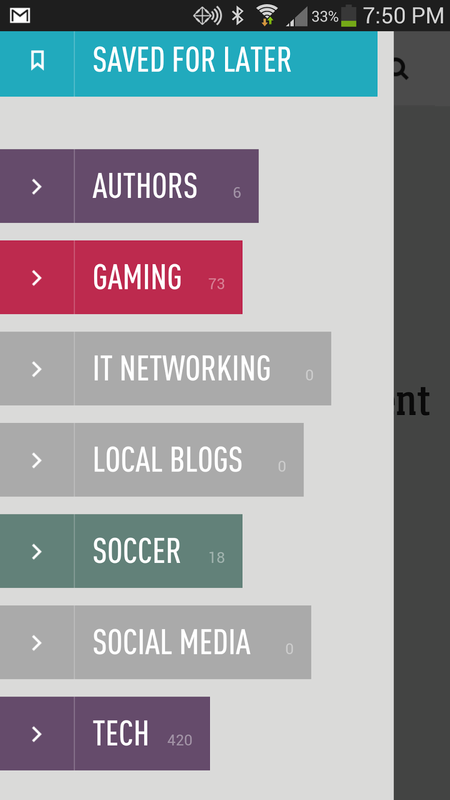 "Feedly beautifully organizes your feeds with picturesque themes." I recently discovered Nextdoor and I think it shows true potential. If any social media platform wishes to break into a top network, it's going to need to find it's own niche among the giants. Nextdoor, to it's user, is a small closed social network that only includes people who live in your neighborhood. When you sign up, verification is required (via telephone, cc, or through snail mail) to prove that you live at the address you say you do. From there you are placed into your respective neighborhood. When you're in you can decide if you want your neighbors to see your actual address (example 1234 White Picket Ln.) or you can hide the numbers from your street. You also have the option of being able to 'Listen' to nearby neighborhoods, to see what's happening just outside your borders. Nextdoor aims to give people who physically live together a micro-network of their own. Depending on your neighborhood and how much you trust the people around you, Nextdoor can be used to find dog-sitters, advertise a garage-sale, or invite others to a block party. One of the most notable uses for Nextdoor is the quick reporting of criminal activity in your neighborhood. 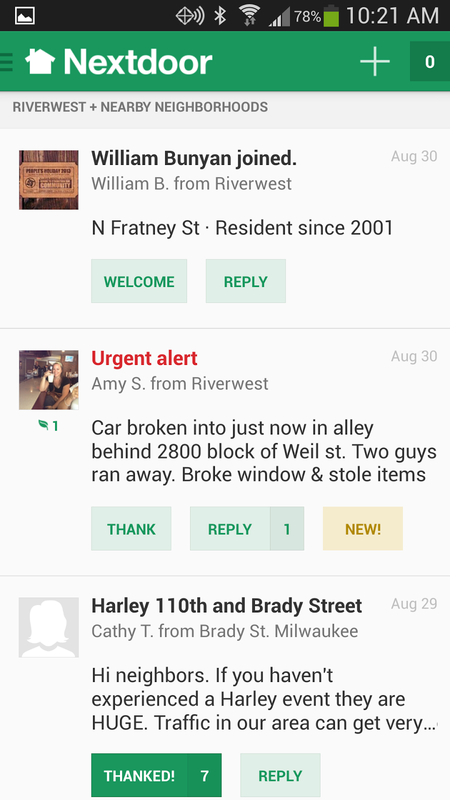 With push notifications for ' Urgent alerts', Nextdoor can quickly inform you if all is not well in the neighborhood. Since I've discovered the app people have been rapidly joining my neighborhood everyday. The app doesn't score any points for aesthetics but it does serve a great purpose and I would keep an eye out for it to become more and more popular as time goes on. "Nextdoor can quickly inform you if all is not well in the neighborhood." Falcon is less of a mobile app and more of a widget, but a great functioning widget it is. At it's heart, Falcon puts a Twitter feed right on your mobile devices desktop with full functionality, ad free! At first glance, it saves you from opening the Twitter app. Which doesn't seem like much time saved, but actually after some time you come to appreciate having your Twitter feed right there for you, ready to go. Falcon really shines on some of its improvements to the way a user's feed behaves. For instance, it highlights a thin blue line on all of the tweets you have not read yet, easily letting you know where you left off last and which tweets you need to start with. Also, a great change that Falcon has improved upon is the ability to see URL content from links directly on the Twitter post when clicked on. Not only does the widget save you from loading up Twitter every time (useful if you are a power Twitter user) but it also saves you from needing to load up a web browser to see the links that are included in the Tweet. This is probably the number one useful feature Falcon brings to the table. The app also includes plenty of visual customization and contains every feature that the standard Twitter mobile app has. "A great change that Falcon has improved upon is the ability to see URL content from links directly on the Twitter post"
Got a mobile app you prefer or just can't live without? Feel free to share! Falcon Pro is by far the best Twitter app I've seen yet and it's developed by a single person. I don't use the widget that much but the app itself is top notch. Definitely will check out Falcon! Great post Ike. Great post! I'll make sure you to send you my first app for free. I'll even put my "signature" in the code so it will be signed by. I'll only do 20 of those. Very exclusive! are you serious Kelly? can't wait to see it! 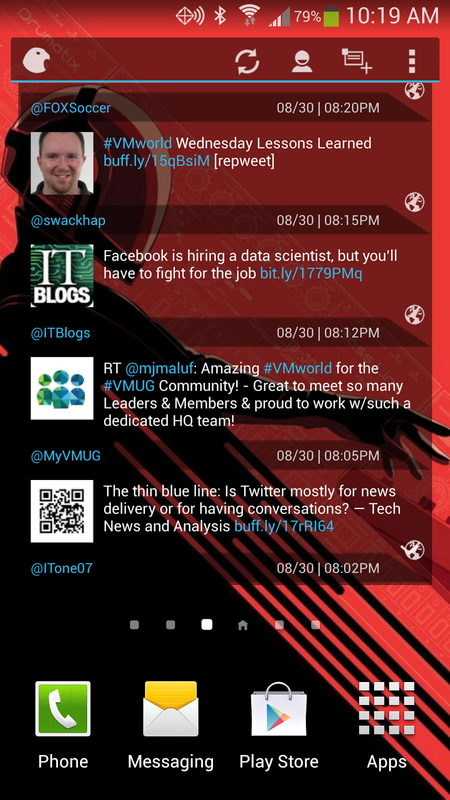 Falcon does have a full Twitter client called Falcon Pro. There are free & paid versions. I love its inline picture viewer & built-in browser. There's much more to it. Our Neighborhood currently uses email to notify people of happenings in the neighborhood, good or bad but it might as well be snail mail. Nextdoor App certainly has potential!